I accidentally took a break from blogging because POTTY TRAINING. Our Christmas was lovely. It was busy and crazy and messy and involved a 4.5 hour drive that required fourteen stops for Everett to not pee, but other than that, there were pockets of peace in between it all. There was an adorably botched gingerbread house and a sleeping Santa baby and a beautifully set table and a quiet movie night. Christmas with two kids this year was not as.....intentional as I would have liked it to be. We missed a quarter of our advent activities due to rain and potty training. We missed our Christmas Eve church service due to rain and traffic and a poorly planned afternoon. Our Christmas morning was a little rushed because it takes us two hours to leave the house and we needed to be somewhere at 2pm (we got there at 4:30, don't even get me started). But hey. We have a toddler and a newborn and we did the best we could under sleep deprived circumstances. Everett was mesmerized by our Christmas tree and loved his gift this year (a super cool ramp for his toy cars). Carson was subject to a lot of hat-wearing and enjoyed his two favorite things on Christmas day: naps and nursing. All in all, a good Christmas for everyone. Well, I am 27 years old and this is my very first stocking. I KNOW. Before you feel sorry for me, I should clarify: I was not deprived as a child. We always had very nice Christmases; stockings just weren't a part of it. But now! We are living in a house with a fireplace! A REAL FIREPLACE! Stockings forever!!! Needless to say, I am a little clueless about all of this, made evident by the fact that Brett and Everett's stockings have already fallen down twice because I put too many heavy items in them (oops). p.s. Tomorrow is the last day to enter The Yellow Note giveaway! Don't forget to enter! I’m not sure at what point this happened, but it seems like over the past three years or so, our Christmas gift-giving has gotten completely out of hand. Every year our shopping list gets longer and the budget gets higher. We spend the majority of December scrambling to find the best deals, pick out the "perfect" presents, and wrap everything neatly in craft paper with homemade gift tags (okay, that last part is more for me than anyone else.) Last year it wasn’t settling well with me. We had a baby on the way, I had just decluttered our entire house, and all of a sudden, I found myself wrapped up (no pun intended) in a holiday that had sadly, become all about stuff. There was no limit to the madness. I partly blame myself because I am such an excellent deal hunter. If you give me a $50 budget, I will stretch each dollar as far as it will go. Example: every year I buy Brett between 10-12 gifts, roughly $5 under budget, and he buys me 3-4 gifts, roughly $20 above budget. We take turns opening gifts on Christmas morning after a breakfast of homemade waffles and mimosas, and he opens three gifts for every one gift that I open. It’s become a bit of a joke but he knows that I take sick pleasure in paying as little as possible for things. In addition to the gift exchange between Brett and I, we also buy gifts for our immediate families (roughly 10 people), participate in two Secret Santa exchanges, and one ornament exchange. This means we are not only giving lots of gifts, but we are also receiving lots of gifts. More gifts = more stuff. And the thing is: I don't want Christmas to be about stuff. I don't want that for me, and I don't want that for Everett. I want Christmas to be special, but not because of the presents. I want to take the focus away from gifts and bring it back to togetherness, away from excess and back to gratitude. For the first time, we get to create our own Christmas traditions. We’re the parents! We get to decide whether or not to do stockings and whether or not to do the Santa charade. We get to set the rules and the expectations. We get to decide when our Christmas tree goes up and when it gets taken down and exactly how many gifts will be under it come December 25th. 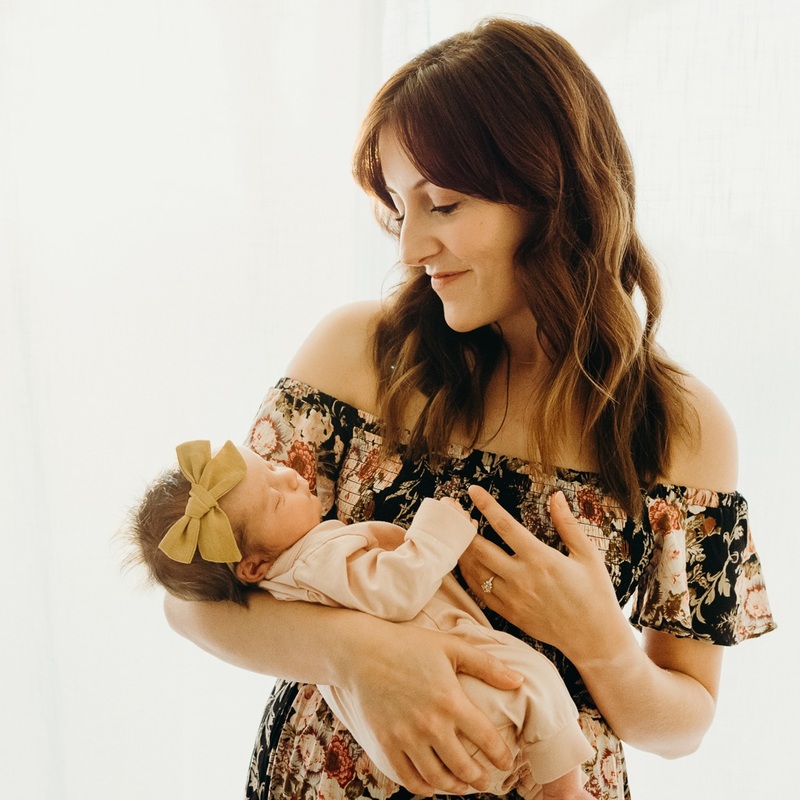 So, we’re taking a note from Jen Hatmaker on this one and sticking to a four-gift rule, starting with Everett’s first Christmas. Each of us will receive something we want, something we need, something to wear, and something to read. It’s simple. It’s thoughtful. It’s enough. We're going to enjoy a simple Christmas this year, but I have a feeling Everett will love it all the same.